Take advantage of recreation opportunities such as an indoor pool, or other amenities including complimentary wireless Internet access and concierge services. Additional amenities at this hotel include gift shops/newsstands, wedding services, and a television in a common area. Make yourself at home in one of the 30 guestrooms. Complimentary wireless Internet access is available to keep you connected. Conveniences include desks and separate sitting areas, and housekeeping is provided daily. Featured amenities include complimentary wired Internet access, a computer station, and complimentary newspapers in the lobby. Planning an event in La Paz? This hotel has 538 square feet (50 square meters) of space consisting of conference space and a meeting room. A roundtrip airport shuttle is provided for a surcharge (available 24 hours). Hostel Porvenir is a colourful yellow house decorated with ornamental plants in the centre of lively La Paz. It offers guided tours and packages and blue-painted rooms with free Wi-Fi. Guests at Hostel Porvenir can inquire at the 24-hour reception desk about guided excursions to the nearby Tiahuanacu ruins and Titicaca Lake, or to the tropical Yungas Mangroves and forests. Rooms at the Porvenir have a yellow and blue colour theme with en suite bathrooms and balconies with scenic views of La Paz. Enjoy a meal at the restaurant or snacks in the coffee shop/café. The hotel also offers room service (during limited hours). A complimentary buffet breakfast is included. Enjoy a meal at the restaurant, or stay in and take advantage of the hotel's room service (during limited hours). For your convenience, a complimentary breakfast is served daily from 7 AM to 9:30 AM. Enjoy a meal at the restaurant, or stay in and take advantage of the hotel's 24-hour room service. A complimentary full breakfast is served daily from 7 AM to 9:30 AM. Satisfy your appetite at the hotel's coffee shop/café. A complimentary continental breakfast is served daily from 7:30 AM to 9:30 AM. Offering an a la carte restaurant, Casa Prado Suites is located in El Prado area in La Paz, 100 metres from San Francisco church and from 16 de Julio theatre. Free Wi-Fi access is available. Rooms here will provide you with a private bathroom with shower and a flat-screen cable TV. Extras include a desk and a safety deposit box. At Casa Prado Suites you will find a 24-hour front desk and a garden. Other facilities offered include a shared lounge, a tour desk and luggage storage services. Daily maid services are provided. Breakfast is included and can be enjoyed on the terrace or in the rooms. The property is a 20-minute walk from Multicines shopping centre and commercial area. El Alto international airport is a 20-minute drive. Airport shuttles can be arranged for an extra fee. 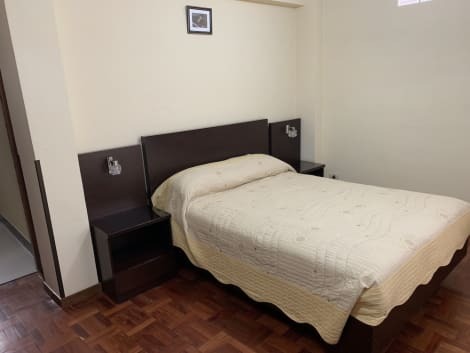 This hotel is clean and well located in the heart of La Paz's Indian district and is suitable for the budget traveller. This is a good hotel, with basic facilities suitable for budget travellers. lastminute.com has a fantastic range of hotels in La Paz, with everything from cheap hotels to luxurious five star accommodation available. We like to live up to our last minute name so remember you can book any one of our excellent La Paz hotels up until midnight and stay the same night.